THE GALLANT HOURS is a superb portrait of Fleet Admiral William F. Halsey Jr. (James Cagney) during the five weeks leading to the U.S. victory at Guadalcanal. The film was a Cagney-Montgomery Production, with Cagney in the lead role and his good friend Robert Montgomery producing, directing, and narrating. They created an unusual documentary-style war film, filled with drama and tension yet without a single battle scene, other than bombs falling in the background on Gualdalcanal. The film had my full attention from its unique opening with the a cappella singing of the Roger Wagner Chorale and Montgomery's narration introducing Halsey. The sequence is available to view on the TCM website. The haunting music is still echoing in my mind hours later. The film depicts a point in the war when all might be lost, and Cagney gives a tremendous performance in a study on leadership and courage under enormous pressure. Halsey maintains that "There are no great men, only great challenges that ordinary men are forced by circumstances to meet," yet watching the film, one cannot help feeling that the war was won by many great men, Halsey among them. The film conveys a strong sense of "you are there" intimacy as the characters deal naturally with the mundane (including Halsey's needle phobia) and the epic. 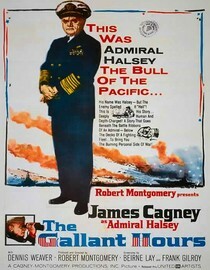 An early sequence in which Halsey plays a hunch and has his plane detour from its planned route to Guadalcanal is an excellent example of what makes the film so interesting, with the officers' chatter and jokes mixed with Halsey making a decision which likely saved the lives of all on board. Over the course of the film Cagney as Halsey shows both the weight of making decisions which will cost other men's lives and the decisiveness and courage he showed under the most trying circumstances. 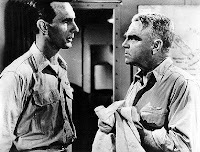 One of the sequences with the strongest impact shows Halsey sending his friends, Admiral Scott (Sydney Smith) and Admiral Callaghan (Nelson Leigh), off to very possible death during the naval battle for Guadalcanal. Beneath the hearty, friendly dialogue, it's the subtext and the unspoken words which are important. With little or no dialogue Cagney conveys Halsey's reactions at decisive turning points, such as Admiral Yamamoto's plane being downed; in that scene he simultaneously conveys great relief, the profound weight of the moment, a humane regret at his Japanese counterpart's death, and a need to maintain an emotional even keel. It's a performance deserving of highest praise, and it's a shame that the film was relatively overlooked in its day. Now, half a century later, perhaps the true worth of the film and its lead performance can be reassessed. If I have any criticism of the film, it's that the choral music should perhaps have been tamped down a bit as the film went on. I love the music, but some restraint in its use might have been a good thing. That said, it's a unique and effective way to score a film, and it contributes strongly to the film's unusual mood. Cagney is backed by an outstanding supporting cast, including Dennis Weaver as Halsey's loyal aide. Ward Costello, Vaughn Taylor, Richard Jaeckel, William Schallert, and Les Tremayne are among the large cast. 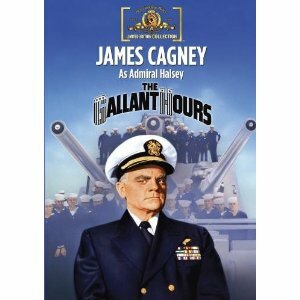 James Cagney Jr. and Robert Montgomery Jr. both had bit parts as marines. Art Gilmore, who passed away last fall, narrates the Japanese sequences. The film was shot in beautiful black and white by the great Joe MacDonald. The script was by Beirne Lay Jr. and Frank D. Gilroy. The movie runs 115 minutes. This was, sadly, the last film directed by Robert Montgomery. 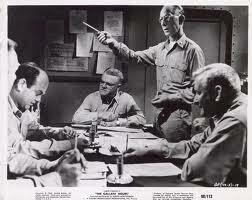 Montgomery began directing doing uncredited second unit work on THEY WERE EXPENDABLE (1945), as well as filling in for John Ford when Ford was incapacitated. Montgomery went on to direct LADY IN THE LAKE (1947), RIDE THE PINK HORSE (1947), ONCE MORE, MY DARLING (1949), and EYE WITNESS (1950). In 1955 he won the Tony Award for Best Direction of the original Broadway production of THE DESPERATE HOURS, which starred Karl Malden and Paul Newman. THE GALLANT HOURS is available on VHS and on an MGM DVD-R. The film is shown from time to time on Turner Classic Movies, and it can also be seen on Netflix Watch Instantly. This is a film I definitely recommend. Other Memorial Day Weekend viewing: THE FROGMEN (1951), DESTINATION GOBI (1953), ICE STATION ZEBRA (1968). I saw this a while back when it was shown on TCM in the UK, and thought it was a powerful film - I've now seen almost all of Cagney's movies, and this must be one of his quietest performances, where he does a lot with little movements or changes of expression. He mentioned in an interview that he didn't like the part (he didn't say why), but he does a great job with it all the same. Enjoyed your review a lot, Laura! Hi Judy! It really is powerful, isn't it? One of those movies that you still think about hours later. I read that Cagney found Halsey a challenge because he had no exterior mannerisms Cagney could latch on to to start forming his characterization -- but that he very much admired Halsey. I agree, it must be one of his very quietest performances -- what a contrast with his next film, the manic ONE, TWO, THREE (1961)!